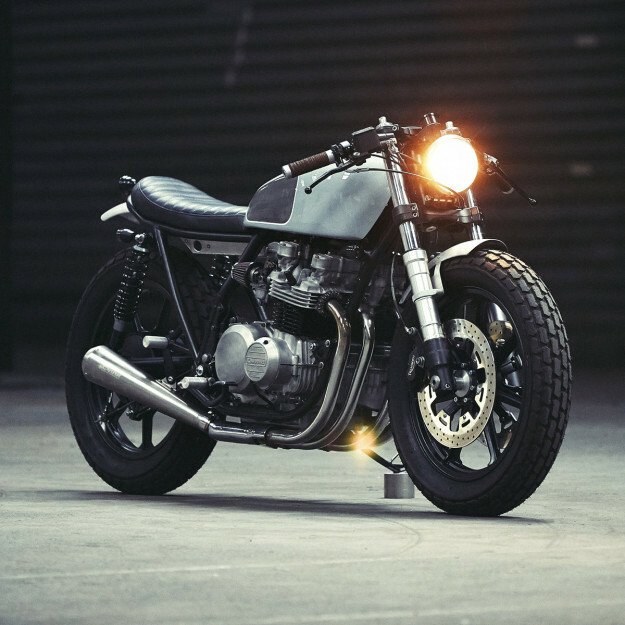 Kawasaki KZ650s don’t come across our desks too often. 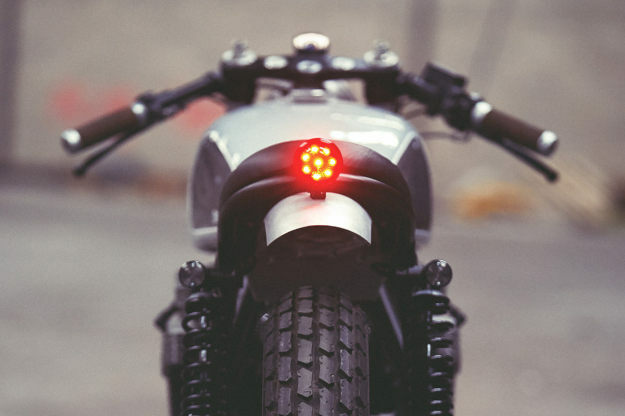 So we were intrigued to see this one from Monsieur Willie Knoll at Paris’ Clutch Custom Motorcycles. Willie has an obsession with lines and details, and a knack for nipping and tucking a bike until everything sits just right. 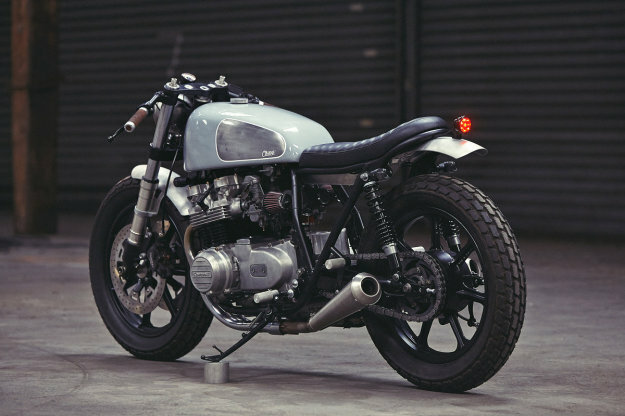 Equally impressive is his eye for finishes—Clutch bikes are delightfully grungy, but never looked slapped together. 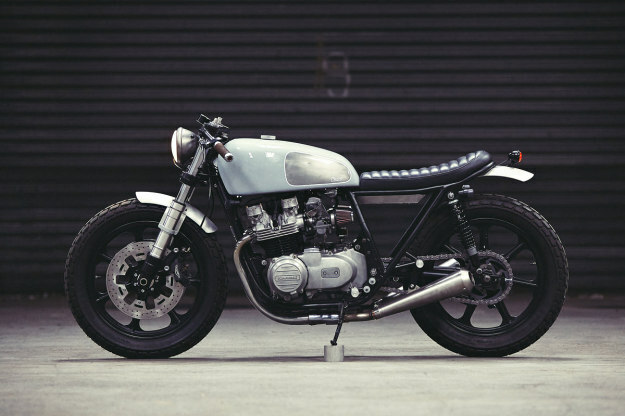 It’s a style that the Kawasaki KZ650 wears well. For starters, Clutch have massaged its stance into place, by fitting an 18” wheel from a US-spec KZ1300 up front. They’ve also lowered the suspension eight centimeters at the front and four at the rear. The tires are Dunlop K180 in matching sizes: 18/5.00. Hooked up to the new front wheel are forks and brakes from a Triumph Speed Triple, connected via a custom-machined triple tree setup and front axle. Out back is a pair of shocks from Hagon—built specifically to match the swingarm, which Clutch shortened. As for the bodywork, the stock fuel tank is retained, but Willie’s redesigned the front and tunnelled it for a better fit. 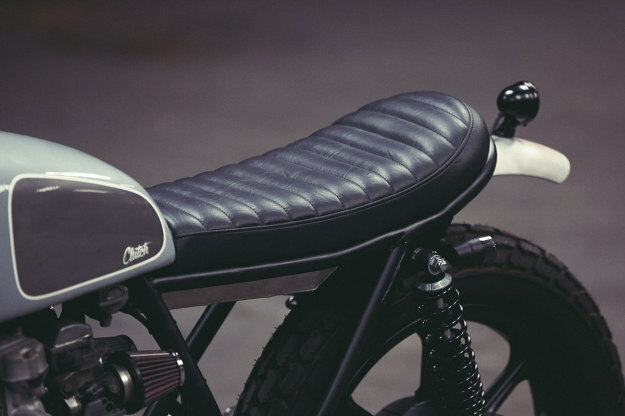 He’s edited the frame too—with a slight kick in the rear supporting a new hand-made seat. 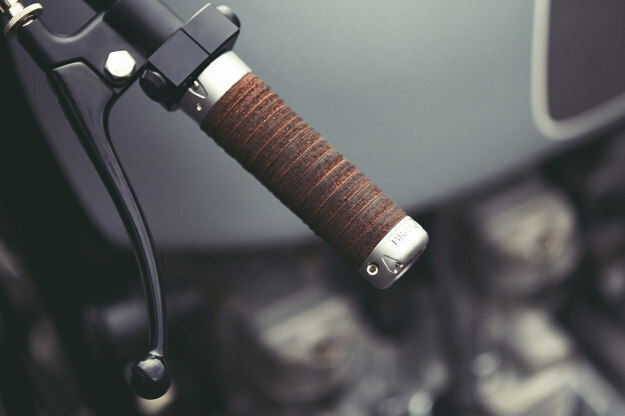 Other hand-made items include the fenders, gas cap, battery box and foot pegs—for both rider and passenger. More discreet lighting components have been fitted too. Clutch treated the 1981-spec engine to a full rebuild, installing a set of K&N air filters and a pair of Spark mufflers. They also rewired the bike using Motogadget components, including a new speedo and switches. Along with a set of clip-ons and Brooks leather-wrapped grips, it makes for a super-neat cockpit. In typical Clutch fashion, the finishes are a subdued mix of raw and glossy textures and colors. 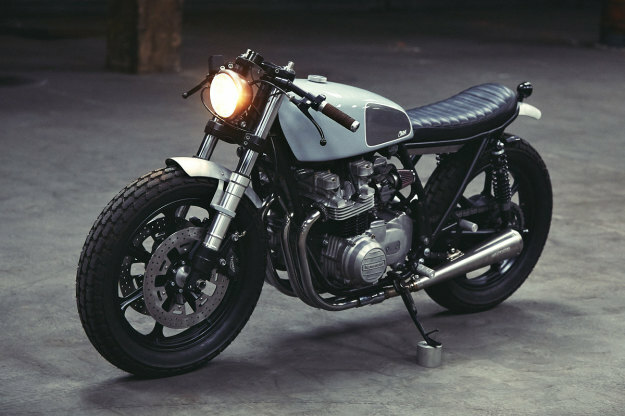 The result is sublime: a Kawasaki KZ650 that looks perfectly at home in the style capital of the world. Clutch Custom Motorcycles | Facebook | See all Clutch builds.